One easy way to know if it is time for roofing replacement in Orillia, ON is the age of your current roof. Most homeowners don’t spend a lot of time on their roofs, so they may not know when it is time for roofing replacement. The clear signs of a roof problem include leaking and drafts coming through the upper levels of the home, but by the time you have a leak, you could have a huge water damage problem on your hands. Water can lead to mold growth and cause a lot of destruction of flooring and drywall very quickly, which is costly to repair. If your roof is drafty, you have probably spent a lot of money in wasted energy to keep the home heated or cooled throughout the changing seasons. Instead of waiting for a big problem to affect your home, it is best to keep an eye on your roof and watch for smaller warning signs. 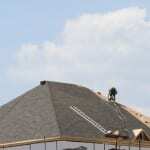 One easy way to know if it is time for roofing replacement is the age of your current roof. Most asphalt shingles only last for 20-25 years, so if your roof is nearing that age, you should have it replaced preventively before a problem occurs. If you don’t know how old your roof is because you are a second or third owner of the home, you can call us at Slippery Slope Roofing for an assessment. During that assessment, our team members will come to your home in Orillia, Ontario and look for shingles that are buckling or curling, as well as areas where the shingles have disintegrated or fallen off the roof. Any of these signs indicate that roofing replacement is a necessity.